As the UPA Government battles the dual challenge of rising food inflation and bringing to life its most ambitious agenda-the Food Security Bill- the Economic Survey for 2010-11 has placed Indian agriculture at ‘crossroads’. The document has called for a Second Green Revolution with newer technological breakthroughs and increased investment in agriculture to sustain high levels of economic growth. High jet fuel prices may clip the wings of India’s soaring aviation sector, the Economic Survey 2010-11 has predicted. 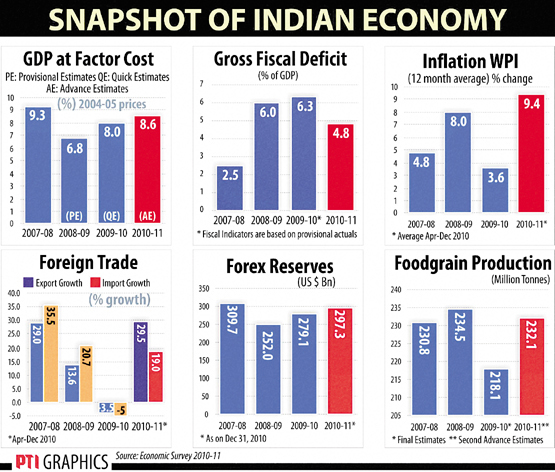 Non-Congress states are scripting India’s economic growth story, reveals the Economic Survey of 2010-2011. Two months after the UNDP’s Human Development Report 2010 placed India far behind China and its South Asian neighbours on the majority of health indicators, the Economic Survey 2010-2011 has shown that the government is not spending enough on social services. India is placed 119th in 169 nations on the Human Development Index (HDI). Pitching for industrial houses wanting to set up banks, the Economic Survey today said that they should be given banking licences to promote the goal of financial inclusion. "As regards allowing industrial houses, business houses and NBFCs to promote banks, they may be allowed full banking license with provision for avoiding conflict of interest issues," the 2010-11 Survey said. Expressing concern over the rise in milk prices, the Economic Survey today warned that the rates may increase further and the country could even turn out to be a net importer if domestic production is not enhanced. The Economic Survey today pegged the fiscal deficit for 2010-11 at 4.8 per cent, lower than the Budgetary estimates of 5.5 per cent, on the back of higher realisation from 3G spectrum auction and buoyancy in revenues. India may have achieved a teledensity of over 65 per cent, but as many as 62,443 villages are still to get a taste of telecom revolution that started since 1995-96, says the Economic Survey 2010-11. "There are still about 62,443 uncovered villages, which would be provided with village public telephones (VPTs) facility with subsidy support from the Universal Service Obligation Fund (USOF)," the Survey said. The Survey notes that agriculture and allied sectors would register 5.4 per cent growth this fiscal due to a good monsoon, compared to a mere 0.4 per cent expansion last year. This means the sector needs to grow 8.5 per cent next fiscal to achieve that targeted 4 per cent growth in the Eleventh Plan (2007-12). 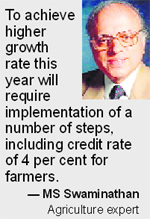 Nearly 8.5 per cent growth rate in 2011-12 however appears far fetched, a fact that leading agriculture scientist MS Swaminathan also agrees with. The survey goes on to observe that the country has not witnessed any big technological breakthrough in agriculture since 1960s even while demand for food has risen sharply with growing income and there have been periodic bouts of price spikes due to supply-side constraints. Food security and farmers’ rights activist Suman Sahai however says that even though the government keeps invoking the second green revolution assuming that new technologies will find solutions to food security, nearly 60 per cent of net sown area in the country is rainfed where the issues are quite basiv. Sahai adds the government must give the highest priority to solve the basic issues of water and soil in rainfed areas by understanding their dynamics. “Good technologies and investment alone will not help. Investment is a must in this sector, but the question is where you will put your money. The Budget must therefore focus on small farmers and soil and water management in rainfed areas. Rainfed areas should be the topmost priority with 80% of investment focusing there,” she says. The Survey has called for raising farm productivity with adequate focus on rainfed areas and diversification from just crop farming to livestock, fisheries, poultry and horticulture. The survey also outlined the special attention that needs to be given to increasing production of nutrition-rich crops like pulses, fruits and vegetables, which remained untouched in the first Green Revolution. It also called for creating infrastructure for transport, storage and distribution of agricultural produce. “The relatively weak supply responses to price hikes in agriculture commodities, especially food articles, in the recent past brings back in to focus the central question of efficient supply chain management and need for sustained levels of growth in agriculture and allied sectors,” it observes. The government’s pre-budget survey admits that sharp price in food price inflation was a major cause of concern of our economy during 2010-11. The whole sale price index (WPI) of food inflation rose to 13.6% in December 2010 on account of unfavourable agricultural supply conditions coupled with the waning of base effects and there are also signs of food and fuel price increases spilling over into general inflation. Among food items sharp rise in prices was observed in onion, fruits, eggs, meat, fish and milk. 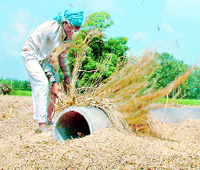 The prices of food grains, however, remain low on the back of good monsoon. The main items of concern in non-food inflation are raw cotton, raw jute, raw silk, copra, caster seed, sun flower, raw rubber, copper ore, zinc, petro chemical, intermediate and industrial machinery and machine tools. The pre-Budget document tabled today in Parliament cautioned that higher crude prices may prove to be a dampener for aviation industry’s ongoing party. If air travel becomes costlier, it would go out of reach for a significant portion of the market that is fuelling the growth of the industry, it said. That is bad news for the industry, which, after being hit hard by the global financial meltdown and high fuel cost, saw a strong recovery in 2010 with domestic passenger traffic rising 19 per cent to 51.53 million. A long-pending demand of the sector has been for rationalising of the price of aviation fuel, considering it accounts for more than 40 per cent of the operating costs. The Economic Survey also notes that “the single largest element contributing to airline costs is aviation turbine fuel (ATF) which accounts for 40 percent of the operating cost of Indian carriers as against a figure of only 20 for international carriers”. According to the survey, ATF in India is priced 60 per cent higher than anywhere in the world. The widening differential in ATF prices and its huge negative impact on airline balance sheet are eroding their competitiveness. “There is a severe risk of dampening of passenger market growth by quickly making air travel out of reach for a significant portion of the market, which was fuelling its growth,” the survey said. Recently, major state-run oil marketing companies hiked the ATF price by four percent, which increased the prices by Rs 2,104 per kilolitre, to take them to Rs 53,538 per kilolitre, the ninth consecutive rise in rates since October last year. Last year, private airlines Jet Airways and Kingfisher airlines hiked their fares due to the increasing ATF prices. Praful Patel, the then civil aviation minister, had requested the finance minister to cut the sales tax on ATF in the general Budget to control the soaring prices. Aviation experts say the comfort zone for domestic flyers except in business class is between Rs 3,500 and Rs 5,500. However, good service you provide, airline is chosen on the basis of fares. As it is, flying has become more expensive for passengers thanks to development fees levied at airports. There is a strong case for giving jet fuel declared goods status but the issue continues to be in a limbo. States are reluctant to lower sales tax rates on ATF as they stand to lose revenue without any immediate offsetting benefit. While the BJP-ruled Gujarat under Chief Minister Narendra Modi has maintained its pace on the growth trajectory, NDA- ruled Bihar under Nitish Kumar has emerged fast. The Naveen Patnaik-led Biju Janata Dal government of Orissa has posted significant improvements in 2009 so has Uttarakhand under the BJP. Even in the UPA’s flagship programmes, the non-Congress governments are doing better than their Congress counterparts so far as inclusion of marginalised sections goes. The Economic Survey reveals that though Rajasthan followed by Andhra Pradesh, UP, Madhya Pradesh, Tamil Nadu and Bihar provided maximum employment under MNREGA in 2009-2010, it was Punjab (ruled by the Shorimani Akali Dal-BJP combine) which employed the maximum Scheduled Castes under the programme (Punjab also reports the lowest number of people below poverty line in India) while the BJP-ruled Madhya Pradesh employed the maximum STs followed by Jharkhand, Gujarat and Chhattisgarh. After Punjab, the maximum SC employment under MNREGA was reported from Tamil Nadu, UP, Haryana and Bihar. On gross enrolment ratios in elementary education also, the Opposition-ruled states of Jharkhand (where the JMM and BJP are in coalition), Madhya Pradesh, Chhattisgarh and Gujarat rank the highest. So far as the progress under the National Rural Health Mission goes, the maximum health centres have come up in Tamil Nadu followed by Karnataka, Andhra Pradesh, Maharashtra, Uttar Pradesh and Bihar. Ironically, though they are doing well in terms of economic growth, non-Congress ruled states like Orissa and Bihar continue to perform poorly on poverty indicators. “The percentage of people below the poverty line is very high in Orissa, Bihar, Chhattisgarh, Jharkhand, Uttrakhand and Madhya Pradesh. Punjab is the best performing state in this category”, the Economic Survey adds. It puts rural income inequality as the highest in Haryana and urban income inequality as the highest in Madhya Pradesh. While the Survey acknowledges the fact that the backward states of Bihar, Orissa and Uttarakhand are showing progress, it also states that the major social sector programme funding is being made available to the states through centrally-sponsored schemes. “The Central support for such schemes continues to expand though most social sector subjects are under state purview,” states the Survey. The Central Government spending on social services and rural development combined increased by 5.52 per cent between 2006 and 2011. India’s expenditure on the social sector - which includes education, public health, water supply and sanitation, welfare of the marginalised communities and nutrition - as a percentage of the GDP increased by a meagre 1.14 per cent between 2005-2006 (when it was 21.1 per cent) and 2010-2011 (when it is 25.2 per cent). This spending is even more dismal when analysed for education and public health. While Government expenditure on public health as a percentage of Gross Domestic Product increased by only 0.4 per cent in the past five years, its expenditure on education as a share of total public spending improved by a meagre 1.3 per cent - from 10 in 2006 to 11.3 today. In health, India was spending 1.23 per cent of the GDP five years ago and is today spending 1.27 per cent of the GDP. The percentage improvement in Government expense on health services is just 0.1 in the last five years if calculated in terms of the percentage of total spending. This explains the losses India suffered on several counts on the latest Human Development Index which put its life expectancy at birth at just 64.4 years as against 81 years in Norway; 74.4 years in Sri Lanka and 73.5 years in China. Pitching for industrial houses wanting to set up banks, the Economic Survey today said that they should be given banking licences to promote the goal of financial inclusion. "As regards allowing industrial houses, business houses and NBFCs to promote banks, they may be allowed full banking license with provision for avoiding conflict of interest issues," the 2010-11 Survey said. Providing access to banking facility to all citizens is one of the main objectives of the inclusive development agenda, it said. While providing banking access, it said, the issue of regulatory robustness for the banking sector should not be compromised. "Recent hikes in prices of milk and milk products have been a matter of concern. The gap between domestic demand for milk and production of milk has put upward pressure on milk prices," the survey pointed out. India's fiscal deficit had ballooned to 6.3 per cent of the GDP in 2009-10 in view of stimulus spending worth billions of dollars to combat global financial meltdown, and was pegged at 5.5 per cent for the current fiscal. In the Budget 2010-11, Finance Minister Pranab Mukherjee had estimated fiscal deficit to be Rs 3,81,408 crore. It said the government has followed the path of fiscal consolidation during April-December FY'11, as it partially withdrew the sops given to the industry in 2008 and 2009. India may have achieved a teledensity of over 65 per cent, but as many as 62,443 villages are still to get a taste of telecom revolution that started since 1995-96, says the Economic Survey 2010-11. "There are still about 62,443 uncovered villages, which would be provided with village public telephones (VPTs) facility with subsidy support from the Universal Service Obligation Fund (USOF)," the Survey said.